North American Corporations love teams — groups of employees with all the technical skills and authority needed to manage themselves. There are many kinds of self-directed teams — quality circles, management teams, work teams, and problem-solving teams are just a few examples. Teams plan, organize, staff, lead, control, and measure. Sometimes they hire and fire, establish budgets, purchase supplies, track expenses, conduct reviews, reward performance, and render discipline. When people take direction from the work itself, rather than rely on procedures and supervision, they often increase productivity and improve quality. Teams do, however, face many obstacles before they produce results. If you're going to be part of a team, work on improving specific skills so that you won't be one of those obstacles to success. The best team players have acquired, and continue to acquire, skill in three general areas: technical, interpersonal, and conceptual. 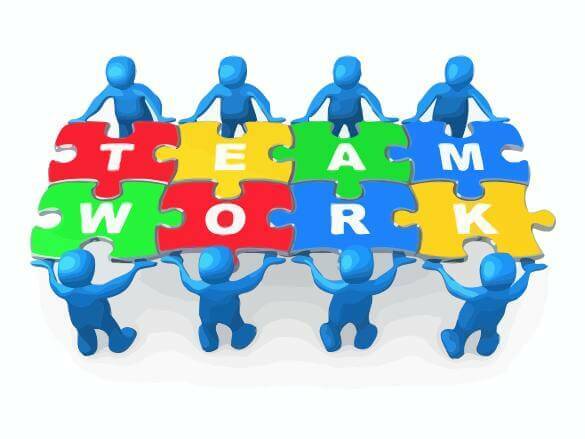 Many organizations require that team members be familiar with the jobs of everyone on the team. Learn all of the skills you will need so that you can perform each task for which your team is responsible. Be sure you have enough knowledge about specialized tasks so that you are able to step in and do someone else's job. In self-managed teams, there are no managers to settle conflicts. For your team to be productive, you will need to avoid conflict when possible, and learn to deal with conflict when it arises. Become a more effective listener — give and receive honest feedback. Learn how to make decisions, both on your own and with a group. Learn to run a meeting effectively. Work on your ability to confront differences constructively and keep focused on team, rather than personal, goals. Learn more about your company — its products, markets, customers, and competitors. The more you know, the more valuable you become to your team and your organization. Develop your ability to analyze strengths and weaknesses. In a self-directed team without managers, members assume this responsibility. Make sure you understand how your team fits together with other teams in the company. Learn all you can about your company's budgets and sales forecasting. Provide training in working on teams. Clearly outline the team's responsibilities. Develop distinct standards for performance evaluation based on team goals (for example, increasing sales or improving customer relations). Enhance team communication by providing tools like electronic mail, fax, or even teleconferencing if necessary. Foster a climate of trust within the company.